This beautifully-made guitar shows the danger of judging a book by its cover. Neck is a work of art. Shape might not get your heart racing. Music Man is becoming known for its far-from-mainstream shapes and styles, but the St Vincent makes instruments such as Albert Lee’s long-running angular signature model - a guitar that was Annie Clark’s introduction to the brand - seem like a comfy ol’ Stratocaster. 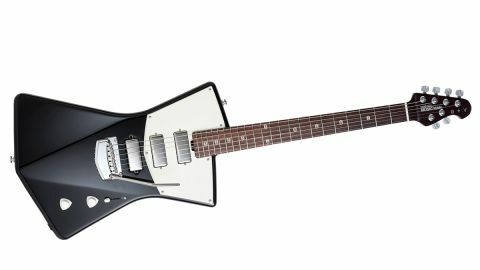 At first glance, it might not be a shape you aspire to - although it does share a family resemblance to Music Man’s forward-looking Armada - but its studied elegance is hugely impressive, a sort of Firebird-meets-Explorer put through St Vincent’s stylistic mangle. The neck is as close to a work of art as we’ve seen. As was her old Harmony: “Yes, the Harmony Bobkat! What I love about that guitar is that it was super-light, and the whammy bar on it was really unique. So that was another guitar inspiration for the signature model.” While some modernist designs can feel as odd as they look, the African mahogany bodied St Vincent is both beautifully weighted (3.52kg/7.74lb) and hangs really well on a strap with the lower bass-side edge very comfortable under your forearm. There’s a conventional rear ribcage cut; the forearm contour itself is an angled chamfer, not curved like a Strat, while the treble side control area is angled to a slightly lesser extent - the straight lines of the upper bouts extending to a point at the base, enhancing the ‘no curves here’ geometry. There’s no cutaway as such: the top treble-side shoulder joins the bolt-on rosewood neck at the 19th fret; the heel barely moves out from the higher bass-side shoulder and, typically, is beautifully shaped, and fixed with Music Man’s usual five-screw joint. The 254mm (10-inch) radius fingerboard, a separate piece of rosewood, has perfectly installed high-profile medium-gauge frets and those custom-designed connected double ‘O’ inlays. The headstock does look small, but string-pull is straight over the compensated nut to the locking tuners with their tasteful pearloid buttons. It’s a hugely considered piece. Of course, at the other end of the string is that modern Music Man vibrato - here, with a slightly pointed cover - while the trio of custom DiMarzio mini-humbuckers are a typically idiosyncratic choice; the neck and middle are suspended on the generously sized, thick plastic scratchplate, and the bridge unit is screwed directly to the body. The headstock does look small, but string-pull is straight over the compensated nut to the locking tuners with their tasteful pearloid buttons. It’s a hugely considered piece. Even the control knobs are custom made, another beautiful detail. Under the hood, we have a standard five-way pickup selector, with its Strat-like selections - the pots are 250k with .047 microfarad tone cap, more Fender single coil than Gibson humbucker. Its acoustic response is a little ‘drier’, more acoustic-y than the Cutlass and StingRay, but once again, intonation and setup are exceptional. Sonically, we have an old-school signal path with no tricks, and compared with the Cutlass we have a bit more oomph and a rounder, darker high-end. But, as ever with three pickups wired like this, you can’t help referencing a Strat, albeit with this different core tonality. Clean, therefore, the St Vincent does sound a little dark, though rich, resonant and beautifully sustaining with a fruity midrange. Switching from classic Fender clean to the meat of a driven Marshall, there’s a hugely impressive thickness, but without the low-end ‘thump’ of a typical single-cut. Even at modest volumes it sounds huge. Annie certainly has her own sonic stew in mind, but remove the vibrato arm and this is a slide-playing tour-de-force. It just proves, once again, that if you judge a guitar by its cover alone, then you are in danger of seriously missing out.